Pretty little village house in historic district of the Tower Philippe le Bel. Street of the rise of the tower, illustrious to connect formerly Avignon and Villeneuve. Renovated house entirely. New built-in kitchen, dishwasher and washing machine, new oven. Room to live with visible stones. Small private outdoor courtyard. Bathroom with walk-in shower. Upstairs, spacious room with double bed. The small bedroom with single bed is perfect for a child. Possibility of additional sleeping if necessary on the ground floor with a supplement. Large mirror and hair dryer. maintenance product for cleaning. Very nice place very friendly owner. Cookware glassware etc could be a little more. No oven. 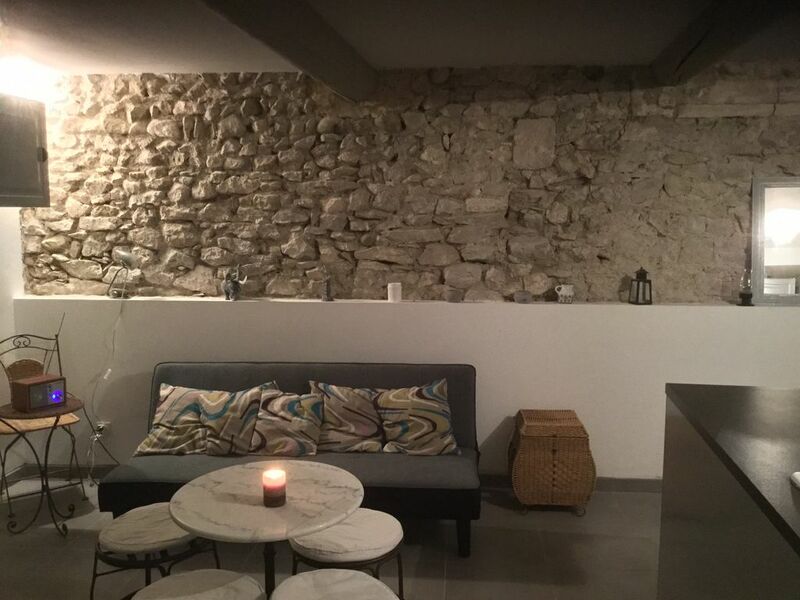 Well located for restaurants, easy parking and access to Avignon's main sites (25 Min walk). Spiral staircase to bedroom. Toilet and bathroom on ground floor. Tiny but well equipped house, the second bedroom not much more than a cubbyhole and the spiral staircase a bit of a challenge especially for night time visits to the bathroom downstairs. But the location is a delight, just up from the tour Philippe le Bel, and further down the road access to the hillside gardens and then into the fascinating historic centre. We walked into Avignon in less than 30 minutes and enjoyed seeing the sights there. But it was a relief to return to the relative calm of Villeneuve and we would happily have spent several more days there visiting the wonderful historic sites and enjoying the town. We loved our stay in Villeneuve-lès-Avignon. The house is close to restaurants, cafes and a supermarket. The house offers everything for self catering, including a dishwasher. The bathroom was very clean with plenty of hot water. The main bedroom is quite large and there is a small courtyard surrounded by grape vines where you can sit. There is a fantastic pattiserie in the village. The market on Saturday morning offers wonderful fresh food and a real local experience. You can walk into Avignon in about 20 minutes. Merci. Thanks a lot Linda. Very good host, nice location, highly recommended - thank‘s to Catalina! Wir haben uns in der Unterkunft sehr wohlgefühlt. Sie ist zweckmäßig ausgestattet und sauber. Die Einkaufsmöglichkeiten und Restaurants in der näheren Umgebung bieten viele Möglichkeiten. Wer in die Geschichte des 14. Jahrhunderts eintauchen oder einfach nur eine schöne Umgebung genießen möchte, ist hier gut aufgehoben. Avignon ist sehr touristisch, aber Villeneuve lez Avignon bietet noch genügend Ruhe. Catalina ist eine sehr gute und unkomplizierte Gastgeberin. Fazit: Sehr empfehlenswert! Le ménage n'est pas compris et la petite maison doit être rendue telle que vous l'avez trouvée. Un ou une aide ménagère peut être engagé selon l'état laissé par les hôtes.